These flowers are amazing and very vibrant when in bloom. Provides lots of beautiful color! Very satisfied with the way these plants shipped and the quality!!! Very pleased with my plants. They are in full bloom right now and are gorgeous. Love my plants alot. I will be a returning customer. The Bearded Iris or the Iris germanica is a perennial flower grown in the northern hemispheres of Europe, Asia, and the Americas. The bulb gets the name from its distinctive look caused by its fuzzy downward-facing petals, which resemble a beard. The flower comes in many colors ranging from white to light purple to blue to deep purple and every color except the brightest of reds. The flower bloom has six petals, three pointing upward and three pointing downward. There are two cultivars, one blooming in the spring and the second blooming in both the spring and the fall. These twice-a-year-blooming plants are called remontant irises. For year-round color, choose flowers from each cultivar. The leaves of the Bearded Iris are sword-shaped broad leaves. The more extended blades can sit straight up, or they may fall. The Bearded Iris' leaf color goes from green to blue-green. The Bearded Iris thrives in zones 3 through 9. They benefit greatly from going dormant in the freezing winter weather of areas that experience full winters. They should get full sun for six hours each day. They also need air circulating quickly around them, so they should be planted at least 16-18 inches apart. The soil should be pH 7 or below; it should be neutral. Water when the ground is dry. Too much water will cause its rhizomes to rot. Bearded Iris is an unpredictable flowering plant. The plant’s blossoms come in an array of purple, red, white, blue, pink, or even a blend of any of them. It blossoms early in the spring and in late summer. This Iris is perennial and will regrow every year. Bearded Iris will adapt to any well-drained soil. 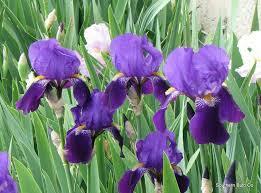 Bearded Iris adds lots of color to gardens and natural areas. They grow well when soil and lighting conditions are right and normally bloom in the early part of spring and late part of summer. Once these beauties have flowered, they can be trimmed back, and they are ready to go for the next year. These are beautiful perennials and grows back year after year. These are a great way to bring nature into a garden as they attract butterflies and also sometimes will attract bees. They grow best when flower beds and gardens are cleared of all weeds around them. When they have finished blooming, and some of the flowers wilt they can be removed so the other stay healthy and beautiful. These are among the most favorite of flowering plants, and homeowners and gardeners love them because they are natural growers and need little maintaining.The Bearded Iris is a tall plant that looks like it has a beard growing. Colors that you will usually see are blue, purple and white. The plant does tend to mix colors often, resulting in beautiful shades of lighter purples and blues. You will sometimes see yellow plants with orange centers. The plant usually grows in May and the spring months, adding color and dimension to flower beds. Some Bearded Iris plants will rise to 48 inches tall with most staying around 24 to 36 inches depending on the care that is given and the environment.